As you arrive into Sydney you can feel the rush and hustle-bustle of this major cosmopolitan global city. You will be personally met at the airport by a DISCOVER AUSTRALIA representative and transferred from the airport to your hotel. You can relax and use the rest of the day to explore your hotel and its facilities, perhaps take a stroll around the neighbourhood and central Sydney. The beautiful harbour city of Sydney, is the largest, oldest and most cosmopolitan city in Australia with an enviable reputation as one of the world's most beautiful and liveable cities. It is brimming with history, nature, culture, art, fashion, design, and cuisine. Sydney is home to two of the most iconic structures in the world, the Opera House and Harbour Bridge, along with the world's most famous beach - Bondi Beach. Who can forget the Sydney 2000 Olympics? Sydney is built around the massive harbour, is next to amazing Pacific Ocean beaches and is surrounded by national parks. Your friendly driver will pick you up in the comfortable air-conditioned luxury coach before sharing experiences, fascinating facts and enchanting stories in the onboard full commentary throughout the morning. This guided tour is the perfect introduction to Sydney, taking you around the city's iconic points of interest, including a panoramic photo stop (Harbour Bridge behind the Opera House), before heading out through the affluent eastern suburbs to Bondi Beach. You will see spectacular Darling Harbour, Sydney Entertainment Centre, Chinatown, Sydney Aquarium, the old monorail stations, Sydney Opera House, The Rocks (Sydney's historic birthplace), Conservatorium of Music, Parliament House, Hyde Park, St James Cathedral, St Mary’s Cathedral, Art Gallery, the Domain and then stop at Mrs Macquaries Chair for superb views of the harbour and city skyline. See the Royal Australian Naval Base at Garden Island, Kings Cross (famous night spot), exclusive Double Bay and Vaucluse, The Gap (stunning views of the Pacific Ocean and the Heads), visit Bondi Beach (world's most famous surf beach), historic and trendy Paddington, Sydney Tower and Sydney Town Hall. 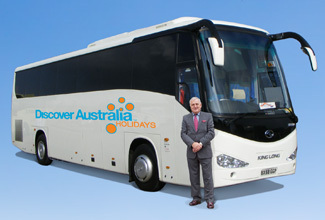 Luxury Day Tour with Hotel Pick Up, Overnight Accommodation. Today is totally flexible. You have a fully guided Hop-On Hop-Off Harbour Sightseeing Cruise taking you to see all of the main sights. You also have entry to Sydney's Taronga Zoo. Taronga Zoo is home to over 2,600 animals and 340 different species across 21 hectares in the leafy suburb of Mosman. It's remarkable to see Giraffes in front of Sydney's skyline and opera house. There's no better way to experience Sydney's awesome beauty than from the harbour, especially when you can decide how long you want to cruise and where to get off to explore. Experience Sydney Harbour at your own pace with our fantastic Hop-Op Hop-Off Cruise combining an independent but structured way to experience the best attractions. You can start and finish when you choose. You could simply stay on-board for a 90 minute guided cruise with great live informative commentary, or just hop-off at any stop and rejoin the circular cruise next time it passes (every 45 minutes). There are a number of great stops, including the key ones of - Darling Harbour (some of Sydney's best attractions including Aquarium, Madame Tussauds, Wild Life, Maritime Museum and more) - Circular Quay (iconic Sydney Opera House, the Rocks historical area, Sydney Harbour Bridge Pylon, weekend markets) - Watsons Bay (one of Sydney's most expensive suburbs, short walk to beaches, lookout points and famous waterside restaurants) - Luna Park (a historic amusement park located at the foot of the Sydney Harbour Bridge) - Shark Island (small island that is perfect for a picnic and swim) - Fort Denison (historic island and restaurant in the middle of the harbour). Simply disembark at any destination, stay as long as you like, then board another boat to reach your next sightseeing destination. Don't forget you have special entry into world famous Taronga Zoo and use of the amazing Sky Safari Gondola for some brilliant views across Sydney. This will be an incredible day of discovery of Sydney's famous harbour and surrounding attractions. Hop-On Hop-Off Sightseeing Cruise, Taronga Zoo, Overnight Accommodation. Experience the majestic Blue Mountains with distant blue haze horizons overlooking incredible canyons, spectacular waterfalls and quaint hamlets that are home to artists and those following an alternative lifestyle. This World Heritage Site really does look blue - due to the rainforests of oil bearing eucalypt that cling to the mountainous cliffs and thickly inhabit the valleys. Breathe in the crisp, clean, mountain top air as you take in amazing features like the Three Sisters. There is a rich history to discover, Europeans first reaching the Blue Mountains in 1788, while the beautiful Gundungurra Aboriginal people have lived here for millennia. This is a very special place. Cross the Sydney Harbour Bridge as you depart the city and make your way up the mountain pass. Tour the township of Katoomba (resort capital of the Blue Mountains), see the Three Sisters rock formation, Echo Point, Jamison Valley. Enjoy free time in Katoomba to explore, enjoy some lunch, perhaps visit the Koomurri Aboriginal Centre (celebrating indigenous culture, art and dance), ride the world's steepest Scenic Railway, ride in a Scenic Cableway gondola or simply walk on the valley floor boardwalk under a canopy of tall tree ferns. We then follow scenic Cliff Drive with magnificent views over Megalong Valley (from Narrowneck). We stop at the quaint mountain village of Leura with some free time - perhaps enjoy the local speciality of traditional English Devonshire Tea of scones, jam and cream (own expense). Time to walk and browse the picturesque mountain village of Leura. We visit Featherdale Wildlife Park (learn about the conservation of local native animals, hand feed kangaroos, experience the emu encounter, walk through rainforest aviaries, walk through koala enclosures, see giant crocodiles). Heading back into Sydney pass Homebush Bay (2000 Olympic Games site), see the stadiums and facilities of the millennium Olympics, cross the famous Anzac Bridge. Free-time activities are optional and at your own expense. This fun filled day will give great memories of your Blue Mountains experience. Luxury Day Tour with Hotel Pick-Up, Wildlife Park Entry, Overnight Accommodation. Time to say goodbye to beautiful Sydney your fellow travellers and friendly hotel hosts. You will be personally met at your hotel by a DISCOVER AUSTRALIA representative and transferred from your hotel to the airport for your flight home. You have 3 choices of accommodation in Sydney. Our "Good Standard" central Sydney hotels have great facilities, a comfortable room and friendly service (typically 3.5 stars). Alternatively, why not treat yourself? The "Deluxe" hotels have superior facilities, stylish rooms and first class service (typically 4 stars). The “Luxury” hotels are upscale with a more luxurious feel for the discerning traveller and great for celebrating an anniversary (typically 5 stars). You’ll receive the FREE DISCOVER AUSTRALIA Bonus Voucher Book that includes $500 value of discounts and bonuses throughout Sydney and New South Wales at shops, restaurants attractions, wineries etc. It’s a great way to save even more on your Sydney holiday. The Sydney Essentials is very popular. Many dates book out well in advance, please book soon.